Want to see what it looks like in real homes? This bidet features a breakthrough in bidet technology with superb innovation, technology and performance. Experience the technological freedom over the past limitations. Top notch and innovative technology allows the BB-2000 to offer unprecedented cleanliness with advanced inside-out nozzle cleaning functionality. BB-2000 is yet another Bio Bidet bidet seat that knows no limitations when it comes to imparting the utmost level of personal hygiene. 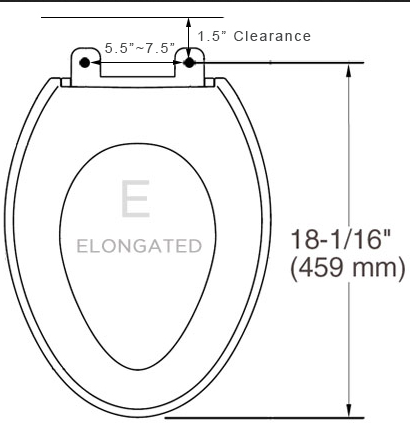 The superior technology and exquisite design makes this bidet one of the most sought toilet seats in the market. With the BB-2000 installed on your toilet there are no boundaries whatsoever for having a relaxed, refreshing and comfortable feel each and every time you use the bidet. This bliss series bidet brought to you by Bio Bidet has everything that you can think of having in your toilet seat. It’s a premier class bidet that brings high end quality and comfort to your bathroom. The new and elegant design is sure to take your breath away at the very first sight. The highly luxurious and modern finish transforms your bathroom into a place that emanates a new style of living. This product was exactly what I wanted. Easy to install, warm water all times with its hybrid system, many settings that can be adjusted and memorize for the next time use, settings can also be adjusted while using setting and memorized for next time use, the remote that is a computer in itself is easy to use and can be conveniently located so that it is in easy reach. This bidet does everything it says it will. . The seat attachment to the toilet is not great. I'm a contractor and have very strong hands. I tightened the seat bolts as tight as I could and the seat still occasionally will shift to one side or the other. Not a big deal but could be better. Biobidet's products are well made, simple to use and quite attractive. The range of options that were included make this a very well priced and competitive product. This is a superior quality item that was welcomed by all in our household. Good product and a good company. I think Dan and others in his company do a fine job in providing information and assistance in guiding you to make the right choice. I've received the Bidet about two months ago and it has been working fine. I like the Bidet. I do have a couple of comments. I found that not all of the water jets line up perfectly; this is not a deal killer, because you can make physical adjustments to compensate for misalignment. My second comment is to advise future buyers to make sure that you have nylon slip washers when installing the lid otherwise the seat will lose alignment and start torquing after a few uses. Good product and a good company. I recommend this product. Unit is wonderful and will be in touch with them, when we are ready for our other bathroom remodels. Everything works great with Bio bidet 2000, and it has all my features. If I were getting another bidet now I would buy this one, although I would look a bit to see if there was one with few features for less. - Enema wash. Only used it twice when I was in a hurry, and it does quicken things up. - Soft closing seat & lid. We always close the lid, a habit formed when we had a dog. But internet articles will explain why everyone should. - Nightlight in blue. We already have an LED nightlight in the bathroom in an outlet by the sink, but having one one the toilet makes it easy to read the remote control without turning on the lights. - Warm air dry. This is a very soft blowing, and I assume that is the norm for bidets. Would take a very long time to get everything dry. Better to do like the Argentinians and just put a separate small towel bar next to the toilet. Everything is clean as if you stepped out of the shower and were drying off after that. - To switch between regular and feminine mode the nozzle does the full retract & self clean. This is pretty fast, but would be a little nicer if it did not. - Would be nice to be able to sit on the toilet lid, but not a big deal for us. Things that I did not expect to use, and that was correct. - Deodorizer function: we have an exhaust fan in our bathroom, so no point in this for us. - Massage and Pulse cleaning functionality: I used regular bidets in other countries and did not expect to find this useful. After trying both, that proves right for me. - excellent water pressure choices with good cleaning. - Adjustable water temperature. After using bidets in other countries for months, in the summer I was surprised to find that cold water is OK if it is hot out. But in winter I like taking the edge out of the water temperature, so we use the lowest heated water temp then. - heated toilet seat. We only use this in winter. This is my first Bidet and I am very happy with it so far. My only complaint is that I wish the remote would light up so the buttons are easier to see in low light. So far, it has done everything as advertised. This is a product that I should have purchased a long time ago. Actually, this is our second one and both are very easy to use. Installation was very easy. The Bio Bidet BB-2000 is one of the few seats on the market that offer a Risk Free Trial. Use the seat, and if after 30 days, you're not in love with it, we'll accept a return for a full refund! * We are not allowed under federal law to resell a used seat (A few internals can be harvested), but we are so confident that you'll love this seat that we're offering the Risk Free Trial anyhow. So buy with confidence, we know you'll love it! The Bio Bidet BB-2000 comes with a 3 year full warranty and can be upgraded to a 6 year full warranty if desired. While the seat tends to outlive the 6 years, you may decide to purchase the extended warranty for peace of mind reasons. We will never charge you for shipping, so the price you see is the price you get! On business days, ships within 24 hours of purchase. If purchased before 1:30 PM EST, tends to go out same day. *risk free trial ends 30 days after the purchase date. Buyer is responsible for return shipping should they decide to take advantage of the risk free trial. Once received, a full refund will be issued.